"Is it starting to sink in?" There are clear, frightening parallels between the contemporary scapegoating of Muslims in America and the persecution of Japanese Americans during World War II. This is how it begins. Anyone who can't recognize this is either willfully ignorant or simply does not care. Bobby Hundreds sees the parallels. Bobby Hundreds, aka Bobby Kim, founder of the apparel company The Hundreds created this limited edition shirt design earlier this year for "What A Time To Be Alive," an social issues-oriented group show at Slow Culture. With fresh talk of a Muslim registry and the "precedent" of Japanese American internment, Bobby recently re-shared the shirt via Instagram and asked, "Is it starting to sink in?" At the top of the year, I designed this T-shirt for an art show at Slow Culture (Manzanar was one of the more prominent Japanese internment camps during WWII). It didn't get a ton of attention at the time. But, now that Trump surrogates are going on the news and citing these camps as precedent for Muslim registry, is it starting to sink in? 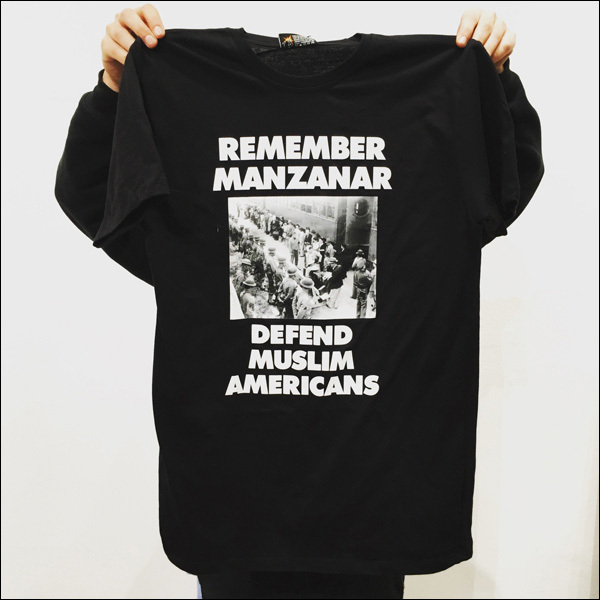 The "Remember Manzanar" shirt was created exclusively for the Slow Culture show and is no longer available. But maybe it should be. Because unfortunately, history appears to be in danger of repeating itself.